BBC CHEVY ALUMINUM SINGLE LOWER CRANK PULLEY SWP # 8841 CLEARANCE! Crankshaft pulley, single groove for BBC engines using a short water pump. 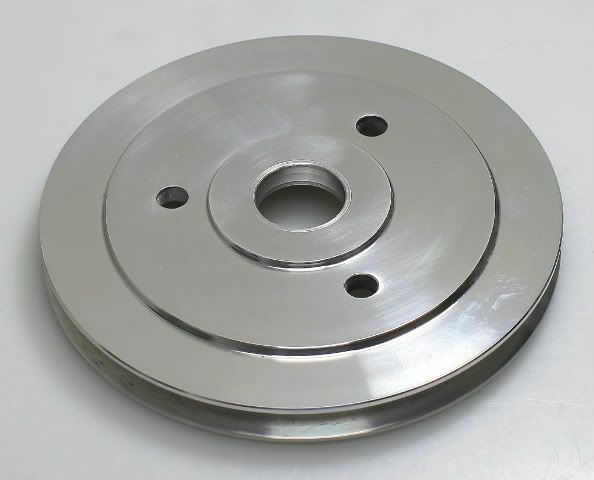 The single groove pulley you will receive has a very shallow dish to it to accommodate the short style water pump. You must have a short water pump to use this pulley. THE OUTSIDE DIAMETER IS 6.25". If you have a long style water pump on your engine, this pulley will not line up properly. This crank pulley is for those running a short style water pump on a bbc big block Chevy engine. We do offer a full line of BBC pulleys in our other listings. This crank pulley is for use on short water pumps used on BBC Chevy engines. PULLEY HAS RETAILED FOR $69.95 OUR PRICE IS MUCH LESS. 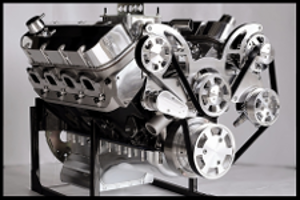 Fits engines using a BBC short water pump. This is a single groove lower crank pulley. The depth of the center of the pulley is very shallow. THESE PULLEYS ARE EXTREMELY HIGH QUALITY. WE CURRENTLY HAVE A GOOD SELECTION OF PULLEYS IN STOCK FOR ALL APPLICATIONS.